Microsoft surprisingly unveils HoloLens together with their official introduction of Windows 10. 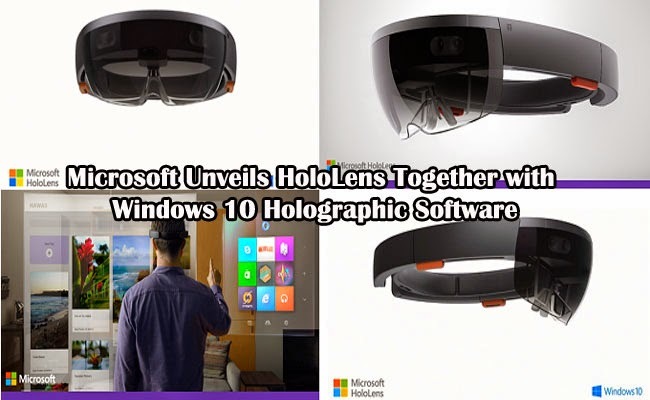 Windows Holographic software has been introduced with the reality headset and now the news had been circulating around the social media. Working in partnership with Windows 10, the Windows Holographic is basically its augmented reality extension. Aurmented Reality is a term used to explain the Windows Holographic as it lets the user see the real world while the virtual things lay on top of the real ones. Windows Holographic will only work with Microsoft HoloLens. The transparent lens lets the user view his actual surrounding but it put virtual images on its overlay. Though both of the hardware and software are still yet to be completed, Microsoft gave a series of demo for the media. The hardware seemed bulky and uncomfortable though wireless, yet, it has a technology that could easily catch the attention of any nerds. Microsoft assures the consumer that Microsoft HoloLens will be ready to be in the market by the time the Windows 10 is released . In a demo described by TechCrunch, a room with various tables and chairs became a platform of interactive Minecraft experience. A person can even change his weapon with just simple voice commands. One can even dig hole in a real physical bench, of coarse in a digital way. In another demo, the user of Microsoft HoloLens was able to share what he sees with another person through Skype. The user can draw various shapes such as arrows in his surroundings while the person on the other line could see it.In reality, the person would seem to be poking in the air while wearing a pair of bulky glasses. The Microsoft HoloLens is still on its way to be completed but the various apps to make it irresistible to be put in it will still depend on third party developers. The price, apps and actual release date is still to be yet to be announced.